District SAS (Servico Água e Saneamento) Liquica through Miguel Almedia (DSAS Manager) has established the cooperation agreement with Aplimentec Foundation (Aplimentec Engineering Consultant) for conducting an engineering survey in water projects. The agreement was signed by both side in DSAS Office, district Liquica in 7 August 2012. Miguel Almedia who represents DNSAS in the agreement said that the agreement is a part of Timor Leste government project for Liquica (PDID) water project that will be implementing in May 2013. 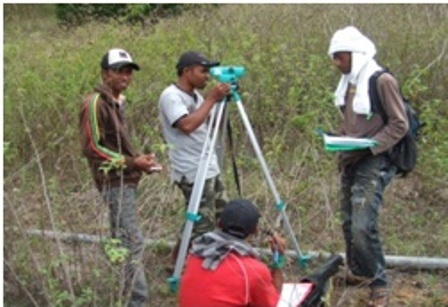 “Timor Leste government trough DNSAS has approved the US$ 942,000.00 budget for water project Liquica 2013. The budget is covered water project in six locations. Therefore, we have proposed to Aplimentec Foundation for supporting government in engineering survey. The engineering survey will include technical assessment, water quality test, topographical, analysis, cost estimation and designs. Government trusts Aplimentec because they have resources and capability in water engineering survey. They (Aplimentec) has proved their works for ten years in water services with high quality standard”, said Miguel. Based on the agreement, Aplimentec has 2 weeks to conduct the engineering survey. The survey’s draft will be reported to DSAS Liquica by 28 August 2012. The final reports on engineering survey will be presented to DNSAS national in Dili by 11 September 2012. “Aplimentec will involve 2 engineers, 6 surveyors, 2 draft men and 2 data entry staffs for supporting the survey. Each team will run their roles and responsibilities to fill the project. I ensure that, we will provide the best services which expected by government”, said Antonio Miguel who will responsible for engineering survey.